Neil Knight of the Air was another new feature created for the Smith-Mann color section, this one a science fiction opus. Credited only to 'Carl and Mac', the feature outlasted the section. The last raygun was fired on October 22, 1955. Notice the Kirby swipe in panel three of our example - always steal from the best! The strip usually ran full page, but here is abbreviated in order to run ads for Sal Hepatica and Ipana. Ads for national mainstream products were slowly filtering into the black papers in the 1950s. Whereas ten years earlier ads were mostly limited to products with a specific appeal to the black community, by the 50s there were now the occasional car, cigarette and beer ads before seen only in the white papers. Some advertisers used their regular ad campaigns, others, like the two seen here, did different versions specifically aimed at a black audience. 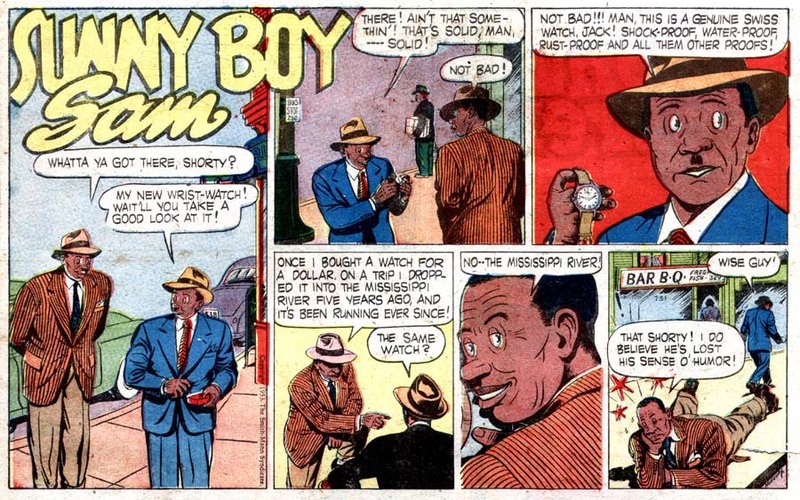 Most of the Smith-Mann Sunday section material was new, but one real old-timer to make the jump to color was Sunny Boy Sam, a strip that had been running in the Pittsburgh Courier since way back in 1928. 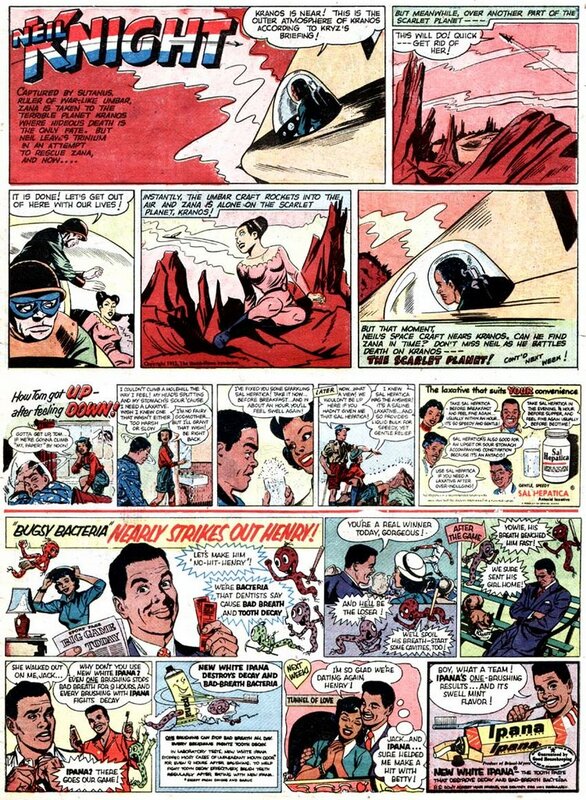 It was created by Wilbert Holloway, and he was credited on the strip until 1969, an impressive run by any standard, though I get the feeling that some portions of the run might have been reruns. 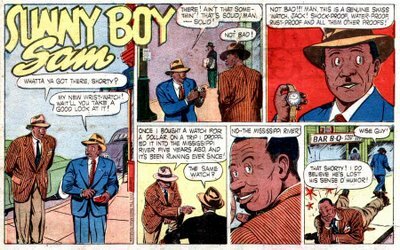 The long run continued under the pen of Clarence Washington until sometime in the 1970s, long after comic strips had become unfashionable in the black papers. The last I know of is from 1976, but it may have run much longer - the film archive I was working from ended with that year. Woody Woodenhead was yet another new creation for the Smith-Mann color section, and one of the few humorous strips to appear there. The star of the strip was named not in the Pinocchio vein but for the the kid not being the highest wattage bulb. The strip was seldom if ever signed, but was credited in Editor & Publisher to Edo Anderson. The strip ran for the whole life of the color section, and then was downgraded with the rest of the strips to running in black and white. Woody's last hurrah came on 8/4/56. The strip did not start with the new section but shortly thereafter it was added, sometime in 1950. 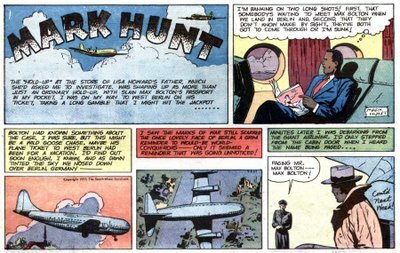 Mark Hunt outlived the color section, demoted to black and white, and ran until October 22, 1955. Here on page four of the Pittsburgh Courier's comic section we find the delightfully drawn Chisholm Kid. The strip was by Carl Pfeufer. His credits include the Flash Gordon clone Don Dixon, done for the Brooklyn Eagle-based Watkins Syndicate, and Bantam Prince for the New York Herald-Tribune Syndicate (blogged here). 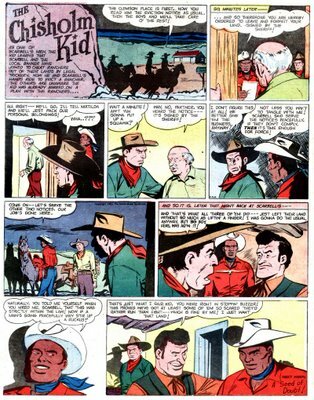 The Chisholm Kid was a new strip created for the Courier's color section on August 19, 1950. As with many of the other strips, it outlasted the color section and was demoted to daily-style black and white format. The Kid rode into the sunset on August 11, 1956. Nothing much to add, except that I am enjoying this run of rarities. I hope there is more. Hi Allan Holtz, I just wanted to tell you the information on my grandfather Carl Pfeufer is incorrect. You have :The strip was by Carl Pfeufer, a black cartoonist whose outstanding facility with the pen had allowed him to cross over the color line and draw for the mainstream syndicates. Carl Pfeufer was not black but German. I've just been having a private discussion with some other comics scholars where we were kicking around just this question. We'd really love to know more about Carl so if you could contact me I'd be very grateful. My email address is stripper@rtsco.com.